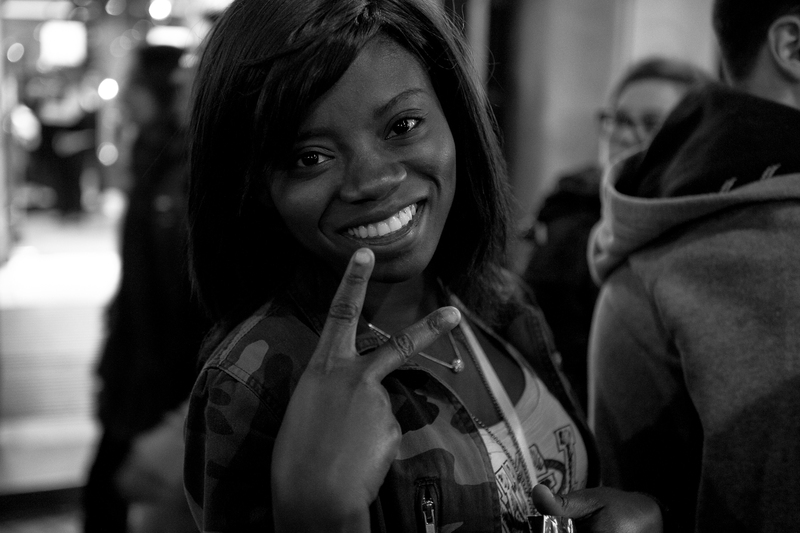 Sometimes when I am taking pictures of strangers in street photography mode I get a really nice reaction like from this woman who smiled and flashed me the peace sign. I was pretty much right in her grille when she flashed her pearly whites and gave me a fun look. There are other times, however, when the subject of my image gets really incensed by my ‘intrusion’. If you’ve taken enough candid images you know what I mean. And then I am having to be quick on my feet with a thank you or some other soothing words. Or, just walk away happy to have my gear in tact. 9 out of 10 times no problem, but, that 1 in 10 could be a huge problem. Shot on the famed ‘La Rambla’ spontaneously. Posted on Saturday, March 30th, 2013 at 10:51 pm. Filed under: Uncategorized Tags: B&W, Barcelona, black & white, black and white, portrait, Spain	RSS 2.0 feed. Sweet shot Chris – I’ve seen you in people’s grill – it’s hilarious, and awesome that you go for shots when the opportunity is there, most people let the moment pass. Great candid shot, you really have talent for street photography!